Bitcoin trading expanded faster this year in emerging markets than developed ones -- and quickest of all in places where authorities tried to crack down. Somewhere, Satoshi Nakamoto is smiling. 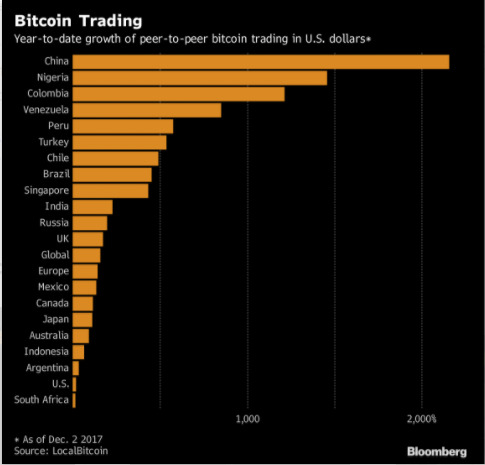 Peer-to-peer bitcoin trading in major developing nations outpaced the US, the world’s biggest market, according to data from LocalBitcoins. Demand surged in China and Russia, where central banks put a stop to local exchange trading; in Venezuela, where authorities cracked down on bitcoin mining even as hyperinflation drove up demand; and in Brazil and Colombia, where citizens heard dire warnings of cryptocurrencies’ risks. Bitcoin landed on Wall Street this week, with the launch of futures on Cboe Global Markets Inc.’s exchange, as the 1,700 per cent surge in the world’s most popular cryptocurrency this year has captivated everyone from mom-and-pop speculators to trading firms. Similar futures will start trading Dec. 17 at CME Group Inc.’s exchange. Nigeria, which sits atop the Trends’ list, saw peer-to-peer transactions rise almost 1,500 per cent this year, as the country went through a foreign exchange market overhaul that led the naira to weaken 12.4 per cent this year. An almost 1,000 per cent rise came in Venezuela, where bitcoin provided a way to skirt the government’s tightening controls on access to US dollars and spiraling inflation that slashes the value of the bolivar.